I never heard my friend Greg Pistol call himself a feminist before this semester. Don’t get me wrong—he’s aware of women’s rights, and wouldn’t make any sexist or disrespectful remarks. He just wouldn’t say “I’m a feminist.” So when he did, it struck me as significant, so I asked him what suddenly made him declare his newfound ideology. To my surprise, he said it was because of a film class he was taking. Greg told me that his professor, Elizabeth Clarke, gave his Women in Film class an assignment to create a Wikipedia page about a female filmmaker from any genre at any time in history. She wanted to make her students aware that the information they see online is selected by the people who are putting it there. In this case, the people are a high percentage of males and almost no females—a wide gender gap that cannot be ignored, even by Wikipedia. But at the same time, Clarke said she doesn’t want to sound cynical about Wikipedia, because it’s a good thing that anyone can edit or create a page on the site. When it comes to teaching, this really shines through. Instead of having students write a paper to their professor, like they do in all their other classes, they can actually create something accessible by other people. “I like the experiential type of learning,” Clarke said. This means learning through experience and reflection of doing. Clarke brought up a 2013 scandal, in which American writer Amanda Filipacchi noticed the lack of women under the Wikipedia category “American Novelists.” Filipacchi thought this may be because some women writers were lesser-known, but soon noticed that many unknown male writers were still present on the list. Then the truth came to light: Wikipedia editors were putting female writers into a new subgenre called “American Women Novelists.” Subcategories of American novelists include genres like science fiction, thriller and mystery. So why are women authors considered a genre of writing? Clarke agrees—problems like these must come from the user base. The underrepresentation of women behind Wikipedia contributes to the lack of female perspectives being presented. “We need to go in and kind of fight against that,” Clarke said. This is why she wanted her students to actively create Wikipedia pages that create more female representation. “Hopefully [my students] are putting more people out there. They’re expanding the knowledge that’s on the internet,” she said. Since this “American Women Novelists” category scandal became public knowledge, many groups have been holding feminist Wikipedia edit-a-thons and how-to’s for digital feminist activism, in an attempt to better represent women on the website. Clarke got her idea for the assignment from a professor at Carleton University who organizes these events in Ottawa. Recently, there was a similar event in Montreal. On March 8, International Women’s Day, a Wikipedia edit-a-thon organized by Art+Feminism was held at the McGill library. Participants were taught to create their own Wikipedia account, and create and edit articles related to art, feminism and other topics. The goal of the event was to improve and encourage the creation of content on women and female editorship. Encouraging women to get involved in creating online content is a big step in changing the way society views them. This goes hand-in-hand with being aware that the information you are looking at was created and chosen by someone. To Clarke, this is something we must be thinking about constantly. She added that her research has always been about identity studies and ideologies, and making sure people are analyzing film, or any kind of media text, with an awareness of power structures and the way things and people are being represented. An important part of this is looking at who makes these decisions. In Greg’s case, Clarke’s wishes have come true—but we have a long way to go before women are properly represented in the content on Wikipedia, or online in general. 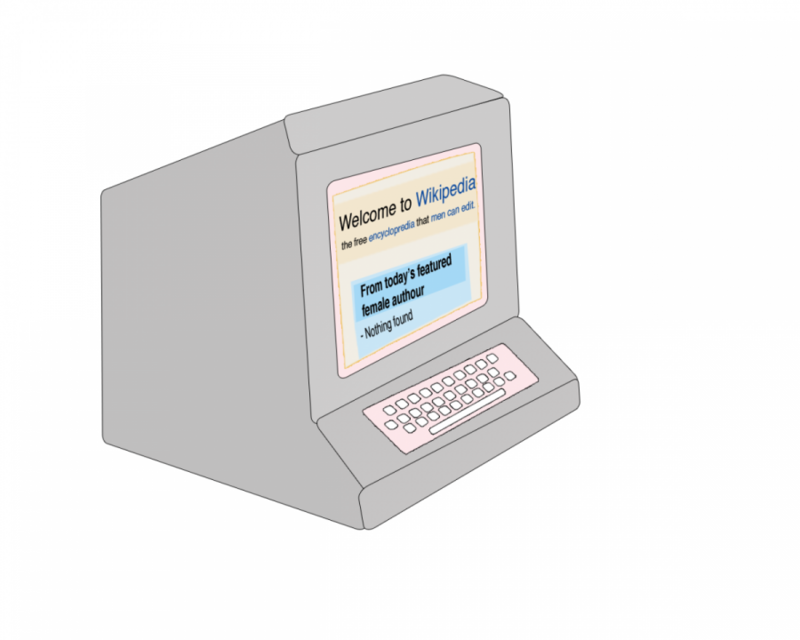 “I want [my students] to not only be contributing to Wikipedia, but thinking more critically about how they use it when they do use it now,” she added. Clarke asked the company that created the website for her class Wikipedia assignment to give her the statistics on how many students went back to edit more content after the course. She was sad to hear that not one had done so, and expressed hope that at least one student would continue editing after her class was over. While women have come very far in their search for equality, it is important to remember that the power structures in every aspect of our lives are imbalanced. Only with this in mind will we be able to strive for equality in a way that actively changes society’s view of women.